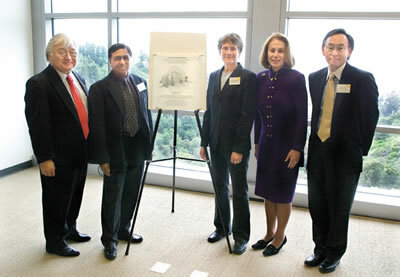 Berkeley Lab’s Molecular Foundry — one of five proposed U.S. Department of Energy Nanoscale Science Research Centers and the only one on the West Coast — was officially dedicated on March 24. Remarkably, construction of this facility’s $85 million, six-story, 94,500 square-foot steel and glass building was completed barely two years after the ground-breaking. The dedication ceremony was held in the Foundry’s fifth floor Cantilever Room, which offers a spectacular view of the San Francisco Bay. On hand to help celebrate the occasion were Berkeley Lab Director Steve Chu and Associate Lab Director for Physical Science, Paul Alivisatos, who will head the Foundry’s inorganic nanostructures research program. Also presenting remarks were Sunne McPeak, Secretary for Business, Transportation and Housing for the State of California, Altaf Carim, from DOE’s Office of Science, and Congressman Mike Honda, who represents Silicon Valley and is one of the leading supporters of nanoresearch on Capitol Hill. In her opening remarks, Bertozzi offered her highest praise and appreciation to Jim Krupnick and Joe Harkins, respectively the Molecular Foundry project director and project manager. 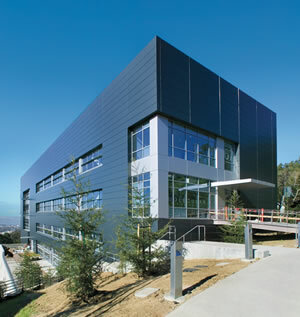 The Molecular Foundry was designed by the SmithGroup of San Francisco and constructed by Rudolph and Sletten General Contractors, working in close collaboration with staff from Berkeley Lab’s Operations divisions, including Facilities, Environmental Health and Safety, Engineering and Information Technology Divisions, plus Procurement and Finance Offices, and other Lab groups. It is expected that the state-of-the art design and energy efficiency technologies used in the construction of the Molecular Foundry will result in its becoming the first Berkeley Lab building to receive a prestigious LEED Silver rating from the U.S. Green Building Council. Qualifying a research building for this rating is difficult because of the high-energy use such facilities typically incur. However, the Molecular Foundry is projected to consume 30-percent less energy than the already-stringent California requirement for laboratory buildings. “This building is like a cauldron where we can take basic scientific information and make things happen that will enhance our lives,” said Congressman Honda, who was a co-sponsor of the 21st Century Nanotechnology Research and Development Act. In his remarks, he announced his sponsorship of new nano legislation aimed at helping research get to the commercial market. In his welcoming remarks, Director Chu praised Daniel Chemla for having conceived of the idea for the Molecular Foundry back in 1991. 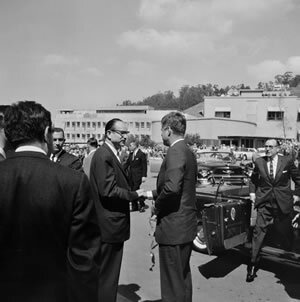 At the time, Chemla said that such a facility would “change the paradigm for nanoscale materials research.” Chemla attended the dedication ceremony along with his wife, Berit. Technology at the nanometer scale is not simply today’s micro-technology only smaller. At the nanoscale, which is one thousand times smaller than the microscale, matter exhibits very special properties because of quantum size effects, altered thermodynamics, and modified chemical reactivity. This presents special scientific challenges that the facilities at the Molecular Foundry are designed to meet. Research at Berkeley Lab’s Molecular Foundry will encompass “hard” (inorganic) materials, including nanocrystals, nanotubes, and lithographically patterned structures, and “soft” (organic and biologic) materials, such as polymers, DNA, proteins, and components of living cells. Nanometer lengths-of-scale are where investigations into hard and soft materials meet. To study this common ground, researchers at the Molecular Foundry will invoke the primary fabrication strategies of both the “top-down” approach practiced by solid-state physicists and physical chemists (in which existing structures and objects, such as semiconductors, are made smaller); and the “bottom-up” approach used by chemists and molecular biologists (whereby atoms and molecules are connected together to make larger structures and objects). The Molecular Foundry will host its own research program and collaborative programs with visiting researchers and will also provide training for graduate and post-doctoral students. 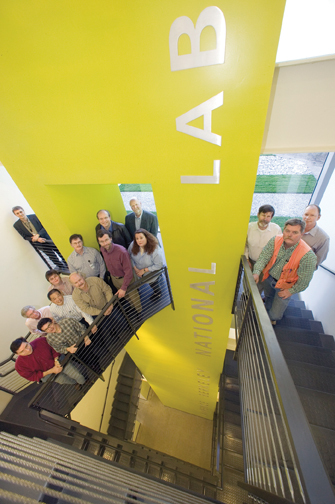 In addition to its research programs and training component, the Molecular Foundry will also serve its collaborators as a “portal” into three other national user facilities at Berkeley Lab: the Advanced Light Source, the National Center for Electron Microscopy, and the National Energy Research Scientific Computing Center. Among the possible developments foreseen for the Molecular Foundry are the fabrication of electronic devices out of carbon nanotubes, the detection and treatment of diseases at the cellular level, the reduction of waste and pollution in manufacturing processes, improved sensors for real-time monitoring of chemical and biological activity, high-performance electricity transmission lines, and next-generation solar cells. 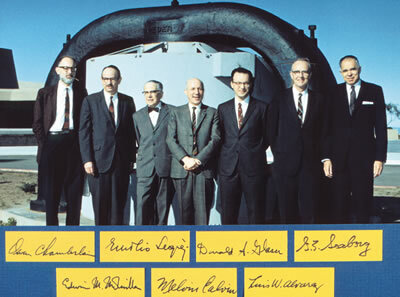 An old-fashioned picnic and barbecue for Berkeley Lab families and friends, featuring the burial of a time capsule and fun activities for all ages, will be the featured event honoring the 75th anniversary of the Laboratory. Built around a 1930s theme, the celebration will take place on Founders Day — Saturday, August 26, when Ernest O. Lawrence first received official authorization to establish his “Rad Lab” in 1931. Also, a special edition of the annual Summer Lecture Series will feature reflections of the Lab’s distinguished past from some of its most prominent contributors. The lineup includes Nobel Laureate Donald Glaser, energy efficiency pioneer Art Rosenfeld, former Laboratory Director Andy Sessler, and long-time researchers Darleane Hoffman, Rich Muller, and Tom Budinger. All talks will take place at noon in the Building 50 Auditorium. At noon during the picnic, Laboratory Director Steve Chu will oversee the placement of a time capsule in the ground on the cafeteria lawn. It will be buried and sealed, with instructions to open it and view the contents at the 100th anniversary in 2031. Employees will be asked to suggest appropriate items to include in the capsule that reflect life and the Laboratory at the turn of the century. More will be unveiled in the coming weeks. Additional anniversary events are being planned and will be announced soon. Robin Lafever’s artworks are familiar around Berkeley Lab: spectacular images of the SNAP satellite, BaBar’s Silicon Vertex Tracker, the GRETINA gamma-ray detector, and a thousand other devices and exploded parts decorating Lab hallways and websites. Much as he loves drawings, however, his real love is 3-D models, the bigger the better. “The closer you can get to the real thing, the better the data,” Lafever says. 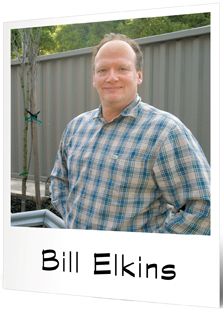 A member of the Engineering Division, he often advocates building a full-scale model before completing engineering drawings. The SNAP camera’s focal plane is a case in point. Mock-ups of SNAP’s unique CCDs and other electronics plug into the model support structure, allowing real cabling to be physically wrestled into place, “an area where CAD” (computer-aided design) “can’t help us,” he says. After he met his wife, Emy, in Bangkok, the two moved to San Francisco. She founded Guillermina Oriental Arts and Antiques and he started a series of small companies, meanwhile earning his degree in industrial design from San Francisco State. 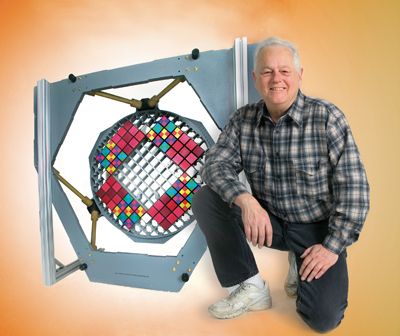 The invention of a rugged and versatile windmill generator made of nylon earned significant royalties and licensing fees for his first partnership. Lafever was building museum-quality replicas of sculptures for museums around the world the day “the Star Wars people asked me to build the power core of the Death Star — which they then blew to smithereens.” He now possesses the only remaining piece of the Death Star within several galaxies. 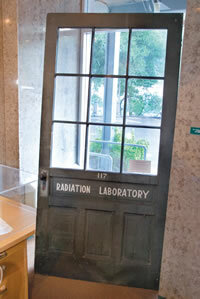 Lafever says he was already retired when he joined Berkeley Lab, but he’s hardly noticed the passing decade and a half. His enthusiasm for models has never waned; if he has his way, he’ll soon be building a full-scale model of the whole SNAP satellite. A diagnostic test that exposes the first inkling of cancer in a cell’s nucleus could someday become a reality, thanks to a team of Berkeley Lab and Purdue University scientists who developed a way to automatically map the three-dimensional distribution of proteins within the nuclei of human mammary cells. The technique, which couples state-of-the-art fluorescent imaging with computer-driven image analysis, could enable doctors to detect aggressive cancers in their earliest stages — giving physicians more time to fight the disease. It could also allow doctors to better characterize a patient’s cancer and match him or her with the most effective therapy. “It won’t replace today’s tests, but it will give pathologists an important additional view of tissue,” says David Knowles, a scientist in Berkeley Lab’s Life Sciences Division who pioneered the system with Sophie Lelièvre, a former post-doc in Mina Bissell’s lab, who is a Distinguished Scientist in the Life Sciences Division. Lelièvre is now an assistant professor of Basic Medical Sciences at Purdue University. Their technique hinges on the fact that inside a cell’s nucleus, proteins arrange themselves in a different pattern depending on whether the cell is malignant, hasn’t developed a specific function, or is perfectly healthy and mature. In the case of malignant cells, this telltale shift in protein distribution is believed to occur before the cells proliferate. It’s as if cells destined to become cancerous tip their hand to anyone clever enough to read it, which is where Knowles and Lelièvre come in. First, they stained breast cell samples with a fluorescent substance that targets a protein, called NuMA, which is found in the nuclei of human mammary cells. When functioning properly, the protein helps regulate various aspects of the cells’ health. But when it malfunctions, the protein has been linked to leukemia and breast cancer. Under confocal microscopy, the tissue samples appear as if they are painted with a large swath of luminescence, indicating the presence of thousands of nuclei and their NuMA proteins. Next, to pinpoint the spatial distribution of the proteins within each nucleus, they applied image analysis software developed by Knowles. The software automatically delineates the boundaries of each nucleus in a tissue sample, and then homes in on the brightest spots of luminescence within each nucleus — revealing the precise location of each protein. A final step allows the scientists to map the distribution of the proteins by digitally unraveling the nuclei, starting from the outer edges and working toward their centers. “We peel away the layers, like an onion, and quantify the proteins in each layer,” says Knowles. Their analyses, which were conducted on tissue samples developed in the lab, reveal that the distribution of NuMA is very different in malignant cells compared to both differentiated cells, meaning they have become specialized for a particular function, and non-differentiated cells. Knowles and Lelièvre can even see the difference between malignant cells and non-differentiated, non-malignant cells that proliferate, which means they can identify cancer-related characteristics that are very difficult or impossible to measure with usual cell biology techniques. Although their technique is still in the early developmental stage, it could also contribute to the current thrust in breast cancer treatment, in which scientists are working to understand the different shades of cancer, and target each shade with specially tailored therapeutics. This method requires a degree of characterization that today’s techniques can’t always deliver. For example, pathologists currently examine potentially cancerous tissue samples using techniques such as Hematoxylin and Eosin staining. Although this workhorse test will likely be used for decades to come, it is a broad-brush tool that mainly captures changes in the shape and spatial distribution of cells and nuclei. If changes to smaller scale phenomena are captured, such as the distribution of individual proteins, then pathologists will able to better characterize cancer — and attack it with the best treatment. 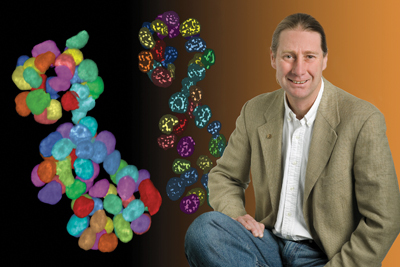 So far, Knowles and Lelièvre have only used the technique to explore how changes to one nuclear protein, NuMA, impact the malignancy of a cell. In the future, they’d like to broaden their inquiry by mapping a range of proteins, and determining if changes to their spatial distribution are also a hallmark of cancer. Ultimately, their technique may join the many tools physicians use to diagnose and characterize cancer, such as genetic tests, medical imaging, and Hematoxylin and Eosin staining. Their research is published in a recent issue of the Proceedings of the National Academy of Sciences. In addition to Knowles and Lelièvre, Carol Bator-Kelly of Purdue University and Berkeley Lab’s Damir Sudar and Mina Bissell contributed to the research. Berkeley Lab researchers can still catch the last two installments of a four-part seminar series entitled: Transferring Technology to the Marketplace. 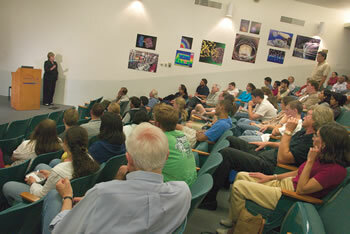 Jointly sponsored by Berkeley Lab’s Technology Transfer Department and the Berkeley Lab Institute, in association with UC Berkeley’s Haas School of Business and College of Engineering, this seminar series was designed to “inspire and encourage” Berkeley Lab researchers to disclose their inventions, as well as to inform Lab scientists about the opportunities that tech transfer provides, and how they can become involved in the process. The series, which started April 5, has been playing to a full house at Perseverance Hall. All talks start at noon and run for about an hour. Employees are encouraged to bring a lunch. The next talk in the series is scheduled for Tuesday, April 25 and is entitled: “What Are Licensees and Investors Looking For?” The guest speakers will be Anna Williamson of Genentech, Eric Fischer of Mobotec US, Inc. (a Berkeley Lab technology licensee), Michel Benard of Hewlett Packard, and Steve Visco, of Berkeley Lab’s Materials Sciences Division, an inventor who founded his own company, PolyPlus Battery. The final talk in the series is scheduled for Monday, May 15, “A Conversation with Venture Capitalists,” features Milton Chang of Incubic Venture Fund, Shomit Ghose of Onset Ventures, Tom Baer of Arcturus Bioscience and Incubic Venture Fund, and Mark Modera, of Berkeley Lab’s Environmental Energy Technologies Division, and an inventor who founded Aeroseal, Inc.
For more information, contact Pam Seidenman, marketing manager for Berkeley Lab’s Technology Transfer Department. This is a story about the people behind the science that gets accolades on the international stage. It is a story of perseverance, creativity, and skill. It is a tale of challenge and triumph, in 5 acts. Members of the Molecular Foundry construction team in the stairway of the new building. They called it a “Molecular Foundry,” and it was to be one of the world’s most advanced facilities for the study of a burgeoning field called “nanoscience.” A six-story edifice would be built to study things so small you can’t even see them with most microscopes. A grain of sand is a million nanometers in diameter. Materials pioneer Daniel Chemla pushed the concept of atom-by-atom design of new structures as early as the mid-90s, along with the need for technology and techniques to enter this new frontier of science. The Department of Energy’s Pat Dehmer in Basic Energy Sciences liked the vision and put together the plan for five nanoscience centers across the complex, one of which would be sited at Berkeley Lab. A “critical decision” (CD) proposal was developed for this new Molecular Foundry in late 2001, and Lab personnel took it to Washington for a critical “Lehman Review” (Dan Lehman’s famous go-or-no-go project reviews). It failed. “It didn’t have the right management model,” said Jim Krupnick, the Lab’s Director of Institutional Assurance. A long-time project manager who shepherded the Superbend and Howard Hughes Medical Institute beamline projects to their completions at the Advanced Light Source, Krupnick says he was at the airport with disappointed lab leaders that December when they asked him to take over the Foundry project. His charge: get a winning proposal together in five months. Incorporating a reconfigured management plan, a new site, and a rare non-scientist (Krupnick) directing the whole thing, CD-1 was approved in May of 2002. Joe Harkins from Facilities was to be the project manager, and then-Foundry Director Paul Alivisatos would oversee the technical requirements. For the next year and a half, the action was procedural, tedious and intense. There was the matter of hiring an architect (the SmithGroup) to work up preliminary designs, and the contractor (Rudolph & Sletten) to start lining up subcontractors and develop schedules. On a parallel track, the legally required environmental review began, and later included a feisty meeting with community representatives and the Mayor of Berkeley in the Haas Clubhouse on campus. Harkins and Alivisatos found themselves verbally parrying with environmentalists concerned about native habitats, the watershed, and unhealthy nanoparticles in the air and water. 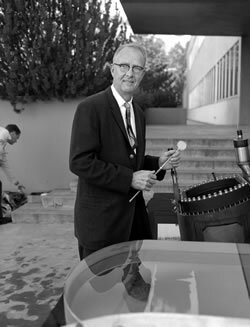 Harkins said some were convinced the Foundry would design the next generation of nuclear weapons. The major players in Environment, Health and Safety at the Lab — John Seabury, Ron Pauer and their staffs — worked closely with the consultants to ensure a challenge-proof assessment and reasonable mitigations. At one point, the suspected presence of the endangered California whipsnake threatened to halt the project, but a biological survey found no habitat for the species. Six months after it began, the environmental review process concluded. The side-hill location between Building 66 and the National Center for Electron Microscopy presented its own logistical challenges, calling for the expertise of Facilities staffers Steve Blair, Mike Dong, Fred Anglis, Larry Domansky, Rich McClure and John Musante to provide the engineering basis for the design. Finally, with the planning milestones reached, the reviews successfully passed, and the legal requirements met, Harkins showed up on Lab Counsel Glenn Woods’ doorstep on Christmas Eve, 2003, when he signed the official notice to proceed with construction. The Foundry, on paper so far, was about to materialize. The construction crew noticed it as they were nearing completion of the retaining wall that formed the 75-foot-wide, 73-foot-deep hole that was prepared for the building — the wall was settling in the unanticipated soft soil. It had moved about four inches over three months. A shoring engineer was summoned, who suggested installing five or six “micropiles” to underpin the project. “It cost a bit more, but the bigger risk was if the wall failed,” Krupnick recalled. “It was money well spent.” The retrofit wasn’t easy. “We had a system of air horns, so that if someone saw something blow at the dig, everyone could get out,” Harkins said. “We used it once, when someone noticed a crack (in the wall).” Except for a small cave-in at the face of the wall, all worked without incident. That’s why you build in contingency to deal with “unforeseen circumstances” in the budget and the schedule, Krupnick noted. Another was the necessary rerouting of the sanitary line to avoid undocumented utilities that were found underground. Concrete slabs, gas lines, and electrical conduits surprised the excavators. The construction manager, Don Beaton, was instrumental in untangling this maze and finding right-of-way for these utilities. 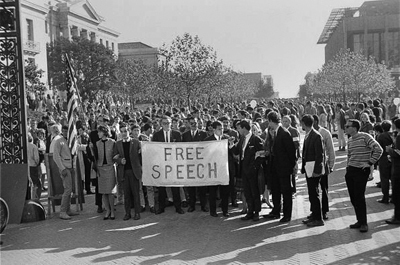 Then there were the delays due to weather — about 10 days — and time lost when union workers honored the picket lines during three of the University of California’s labor contract protests. But each setback fit within the contingencies that Krupnick and company had built into the schedule. The early finish date of December 2005 probably wouldn’t be met, but they were still on course to meet the May 2006 milestone, and still within budget. “The big deal is getting out of the ground,” Harkins said. That landmark event took place in September 2004, when the foundation for a 95,000-square-foot super-science structure began to be laid — 2.3 years after CD-1. 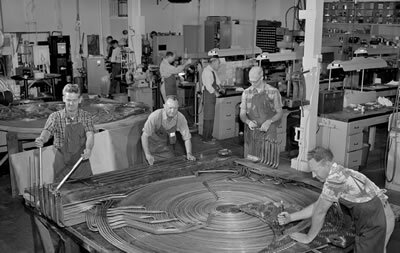 And what followed was a dramatic transformation that involved more than 1,000 different workers, most of them subcontracted labor, assisted by more than 100 people from Berkeley Lab. One of those people, Sarah Eary, was especially critical. She interacted with scientists, the Department of Energy, and Lab procurement and finance representatives to ensure the right people and products were acquired for the job. Eary had to administer the subcontracts and navigate the rough waters of inflating material costs, most importantly structural steel in the fall of 2004, to keep the costs under control. Krupnick also cited Nick Peterson for his role in furniture specifications and acquisition, and fire marshall Gary Piermattei for adherence to safety requirements. Speaking of safety, Krupnick said he was disappointed in the handful of minor injuries incurred by construction workers on the job. But the record suggests he shouldn’t be too hard on himself. No one was seriously hurt, and there were no injuries at all in the last eight months. Workers put in an estimated 450,000 hours on the job, and there was only one lost-time injury. His choice of Rudolph and Sletten as the managing contractor, at least partly based upon their positive safety record in prior experiences, proved to be prescient. The Foundry project involved more than designing and constructing a building. It also included specification, procurement, and installation of more than $17 million of research equipment. That effort was coordinated by Jim Bustillo in Materials Sciences, working with Sue Walker-Lam from Procurement. According to Krupnick, Walker-Lam saved the project “hundreds of thousands of dollars” through deft negotiating techniques. Sarah Morgan was a key contributor in many aspects of the construction phase of the Foundry project. She managed mountains of paper work, processed millions of dollars of payment requests, tracked hundreds of procurements to the penny and was instrumental in the successful completion of several DOE reviews. As this dramatic new frontier plays out, the science that flows from the Molecular Foundry beginning this year will literally change the world. 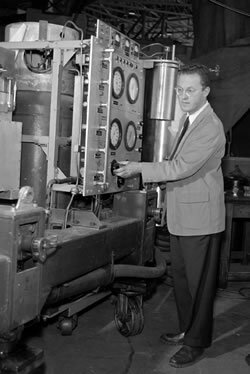 But as Berkeley Lab looks ahead to its next 75 years of achievements, it should pay its respects to the scores of people behind the science who make it all work. Her entrance into the world of emergency preparedness and management came as a fluke — or, more precisely — via a flute. As a professional flutist, Genevieve Pastor-Cohen, did not see herself as a Security and Emergency Operations Program Manager, the position she now holds at Berkeley Lab. But when a fellow trio member mentioned that he thought she would be perfect for a job opening in the California Governor’s Office of Emergency Services, she decided to give it a try. That was 15 years ago. Now music helps her keep calm in a field that is wrought with disaster, literally. Pastor-Cohen joined Berkeley Lab as part of EH&S and Security in January. 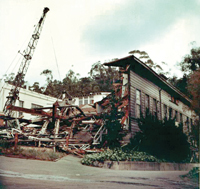 Now on the anniversary of the 2006 San Francisco 7.8 earthquake, Genevieve is spearheading the Lab’s involvement in Berkeley city and other regional efforts to simulate and prepare for an earthquake of similar magnitude. “Being prepared minimizes your chances of being a victim,” she said. 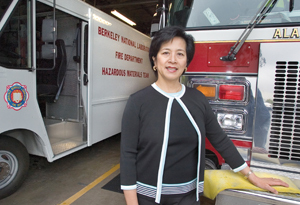 Her goals for Berkeley Lab are to keep staff members and teams trained in emergency planning and awareness. Her charge is to ensure that every group at the Lab will be ready when “the big one” hits. That means practical things like up-to-date telephone trees, emergency checklists and procedures, survival kits, and business resumption plans. Pastor-Cohen worked for the state’s Office of Emergency Services, Disaster Assistance Division and helped local governments recover and obtain grant funds after nine natural and man-made California disasters since 1992. She worked for a number of years as a sales representative for Eastman Kodak and fifteen years in the comprehensive emergency management field, before receiving her Masters of Science in Emergency Service Administration and her Certified Emergency Manager designation in 2005. She also worked as a hazard mitigation consultant after the North Ridge earthquake in 1994. Pastor-Cohen is excited to apply what she has learned in the private sector and local governments to a national laboratory. She explained that comprehensive emergency management includes planning and preparing, prevention and mitigation, response and recovery. It also involves using common sense and being creative when the electrical and communications systems we depend on fail. She connects the creativity she finds in emergency management to the creativity and improvisation that she finds in music. Pastor-Cohen continues to play the flute in the Alameda Civic Light Opera’s summer musical productions and for the Holy Names Orchestra. 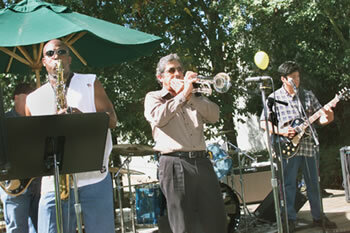 She also plays in a number of musical groups at her temple. It all started when former Lab employee and Berkeley City Councilman Gordon Wozniak was reading through the draft EIR for the demolition of the Bevatron. These are the figures that wowed the city council and mayor Tom Bates: since 1993, the lab has reduced sanitary waste by 71 percent, hazardous waste by 78 percent, low-level radioactive waste by 74 percent, and mixed waste by a whopping 91 percent. How did we do it? Increased awareness, the cost of disposal, and government mandates have resulted in researchers and other employees taking more interest in minimizing waste, says Nancy Rothermich, head of the Lab’s Waste Manage-ment program. These efforts were aided by the implementation of the Environ-mental Management System, which brings together a team of representatives from across the Lab to develop ideas on how more reductions can be made in such areas as energy, water, and chemical use. Members propose projects, prioritize them, then select one or two to focus on each year. Two examples include the use of digital imaging, which reduces the use of photo chemicals, and, the use of alternative fuel vehicles which reduces petroleum consumption, says Rothermich. According to Powell, the city is also planning to issue proclamations for the Lab’s efforts to reduce energy use, educational outreach, fire-risk reduction, and scientific achievement. Berkeley Lab physicist Carl Haber is among the 187 artists, scholars, and scientists selected from almost 3,000 applications to be a Guggenheim Fellow. Guggenheim Fellows are appointed on the basis of distinguished achievement in the past and exceptional promise for future accomplishment. 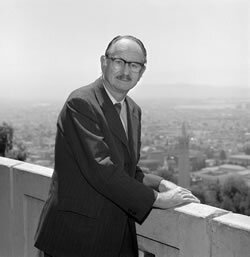 Haber was honored for his work in optical methods to recover sound from mechanical recordings. Berkeley Lab Director Steve Chu named Steve Gourlay director of the Accelerator and Fusion Research Division (AFRD). Gourlay, an AFRD scientist since 1997, has been acting director of the division since January, when Bill Barletta resigned after 12 years as AFRD director to head the U.S. Particle Accelerator School at Fermilab. Before becoming AFRD director, Gourlay was head of Berkeley Lab’s Superconducting Magnet Program and the magnet development component of the U.S. Large Hadron Collider Accelerator Research Program. Sirna Therapeutics, a leading RNAi therapeutics company, has announced its Scientific Advisory Board (SAB), which includes Berkeley Lab Associate Director for Life and Environmental Sciences, Joe Gray. He is one of 11 world-renowned scientists who bring expertise in key areas that will help in transitioning Sirna’s pipeline programs from discovery to the clinic. Sirna is a clinical-stage biotechnology company developing therapies for serious diseases and conditions, including age-related macular degeneration (AMD), hepatitis B and C, dermatology, asthma, Huntington’s disease, diabetes and cancer. Duke University, located in Durham NC, will award four honorary degrees during its May 14 commencement ceremony. Among the recipients is Lab Director Steve Chu. 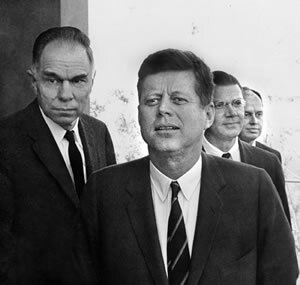 Others include broadcast journalist Nina Totenberg and James Wyngaarden, former director of the National Institutes of Health.